while keeping the sampling frequency unchanged. The first part of the problem (a) is to generate the sequence having half the frequency of . For zero-order interpolation, the interpolated samples can be generated by holding the current sample till the new sampling instant (Ref: Section 9.3.1 -Sample and Hold ). The impulse response of such a system is a rectangular function. For first-order interpolation with delay, the interpolated samples are generated by piece wise linear interpolation between the current sample and the previous sample. As the prediction based on current sample and previous sample can have ‘jumps’ at the next sampling instant, delay of one sample is provided (Ref: Section 9.3.3 – Linear interpolation with delay ). The impulse response of such a system is a triangular function. For constructing these sample from MATLAB, let us use the technique provided in part (c) of the problem i.e. 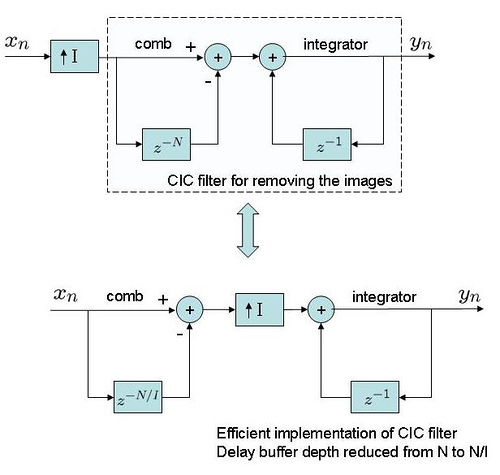 add zeros and pass it through a filter for obtaining the interpolated samples. For zero-order interpolation, the filter function is a rectangular function i.e. .
For the delayed first-order interpolation, the filter function is a triangular function i.e. . The factor of 1/2 is for normalization. For the first-order interpolation case, note that the effect of delay is removed and plotted. Let us further analyze the harmonic distortion from the generated sinusoidal’s. 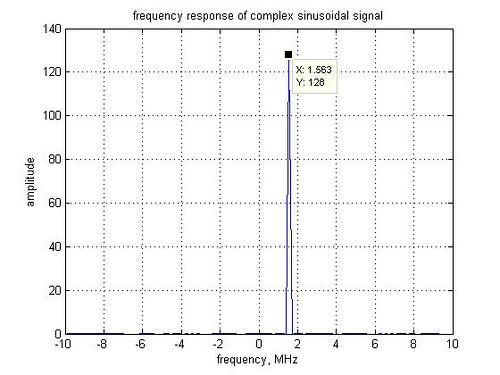 From the frequency domain transfer functions, it can be seen that zero-order interpolation has a slightly relaxed transfer function for high frequency components when compared to the transfer function of first-order interpolation. Analytically, for the zero-order interpolation, the transfer function is a shaped function whereas for the first order hold, , the transfer function is a shaped function. As for all , it can be argued that thought the desired frequency in first-order hold is slightly more attenuated when compared to the zero-order hold, the higher frequency components are more significantly attenuated first-order interpolation. Hence the better performance. From a time domain perspective, it can be seen that the waveform obtained from first-order interpolation has a closer match with the ‘perfect wave’ when compared with the waveform obtained from zero-order interpolation. For part (e) of the problem, when the input samples having a triangular spectrum is to be passed first through the zero insertion block to generate followed by the filtering operation to generate . With the sampling frequency kept unchanged, insertion of zeros causes the signal bandwidth to be half the original spectrum, additionally the spectrum gets aliased to be around . Note that, typically no one would want to distort the original spectrum and hence sampling frequency typically gets doubled when zeros are inserted (over-sampled). In that scenario, shape of the original spectrum centered around-dc remained unchanged, however with the spectrum gets aliased to around . The high frequency components present around need to be removed by a digital filter. Sauch a circuit having “over sampling followed by digital filtering” is used in typical transmitter implementation. and I expected that the lines will coincide with your lines. But they are different. Do you know, why? @David: Well, true. I too was trying to play with it and get the lines to overlap with each other – but they are not. Let me explore this bit more and revert. @David: When playing with it and comparing the frequency response of a wider rectangular pulse, could see that for frequencies close to dc, the responses are overlapping. However, the deviation starts showing up for higher frequencies. Is it something related to do with digital representation? If you have a zero order hold system that holds the data for ‘q’ time periods what would its transfer function be? Also for a zero order hold the TF= (1-1/z)/s … If we assume a system with no hold, the TF =1 … How will you proceed from the former case to the latter? by substituting s=0? in that case, the TF becomes 0/0 =1? @Raghavan: Holding the data for ‘q’ time periods is equivalent to passing the data through a filter having a rectangular pulse shape. What is the transfer function of zero-order hold? @usman: Zero order hold has a rectangular response in time domain. [1 2 1] are the filter coefficients in first order hold…..the normalization factor should have been sqrt(6)……why it is 2?? @VA: 1^2 + 2^2 + 1^2 = 6. Agree? @Mohit: Zero order hold has a rectangular response in time domain. @ Kanhe Ram K: I am not familiar with the ‘zero-order predictor’ aspect. Is it same as zero-order hold? If it is same as zero-order hold, its just keep the previous sample before the new sample comes.